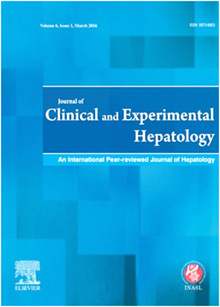 "Journal of Clinical and Experimental Hepatology (JCEH) is an international peer-reviewed journal of hepatology and is published quarterly. JCEH publishes outstanding basic and clinical papers on all aspects of liver diseases, including both human and animal studies. JCEH is directed to gastroenterologists, hepatologists, liver transplant surgeons, pathologists, radiologists, and others involved in the research and treatment of a broad range of liver diseases."